Your Chamber of Commerce and the City of Pittsburg have events planned for every weekend in April. It means that thousands of visitors will visit Pittsburg and Camp County over the next 30 days. What does this say for our community? Tourism dollars and economic development! Visitors will purchase gas, eat dinner at a local restaurant, stay in a local motel or bed and breakfast, and shop our local merchants. They will buy a bottle of water and pick up a few things at Brookshire’s. We’ll show them our Pittsburg hospitality, and they will want to come back for a weekend to discover all that makes our community unique. 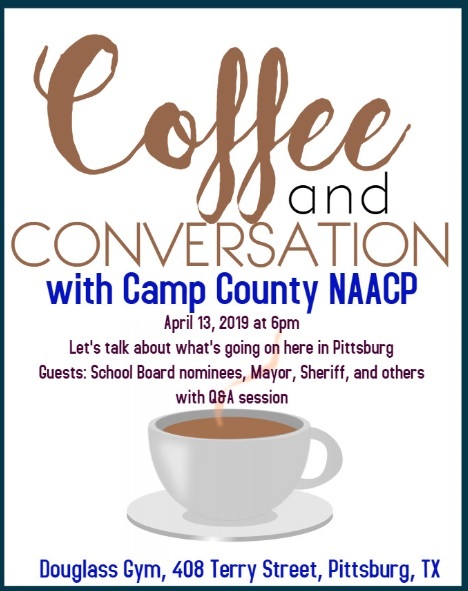 Please join us, and the many guests visiting Pittsburg and Camp County, as we celebrate our community throughout April. 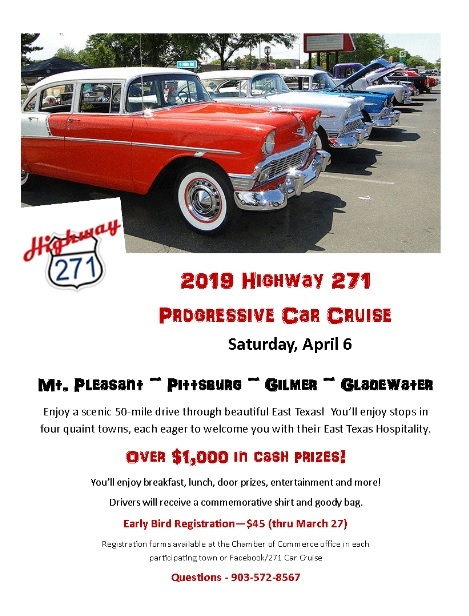 If you enjoy classic cars, you won’t want to miss this year’s Highway 271 Progressive Car Cruise. Dozens of classic cars will be on display downtown from 10:30 am until noon. 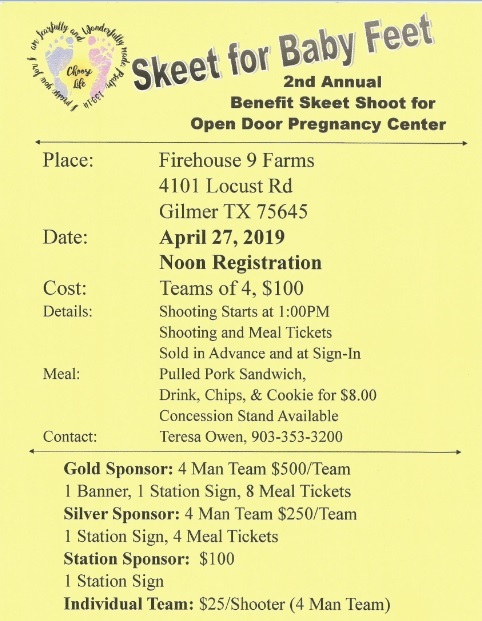 Participants are participating in a four-town event that starts in Mt Pleasant, and then makes stops in Pittsburg, Gilmer, and Gladewater. 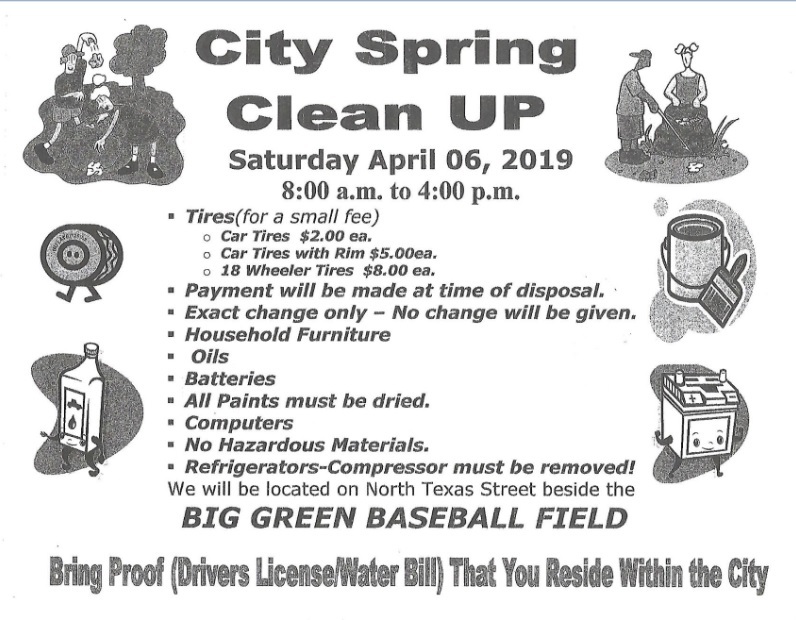 Bring a Truck, Bring a Trailer, Bring a Friend. 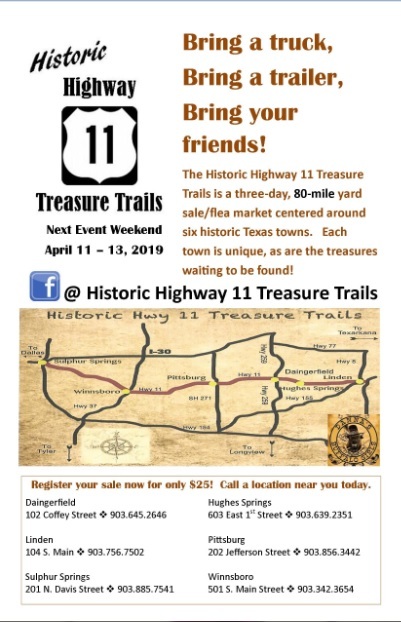 The Historic Highway 11 Treasure Trails is an 80-mile yard sale/flea market that includes six towns: Linden, Hughes Springs, Daingerfield, Pittsburg, Winnsboro, and Sulphur Springs. You’ll search for treasures all weekend long. Don’t live on Highway 11 but want to sell your “treasures?” The Chamber of Commerce has established a new “Junk in the Trunk” sales area. 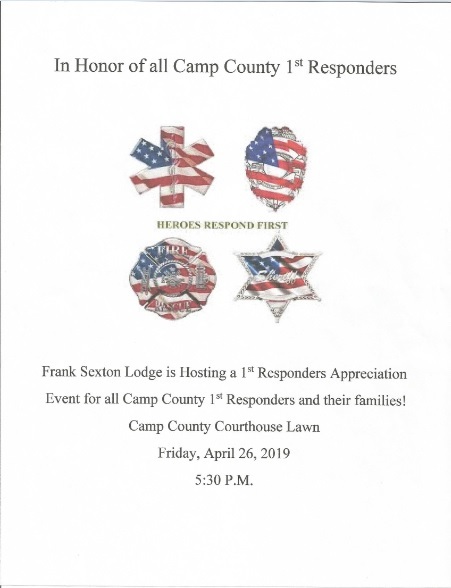 It is a free event. Contact us at 903.856.3442 for more information. The City of Pittsburg will be hosting the Seventh Annual Art and Wine Festival on Friday evening from 5:00 until 9:00 and Saturday from 11:00 am until 7:00 pm. Attendees will enjoy wine tasting from eight vineyards, as well as exceptional artwork and delicious food tastings, including a Meat & Cheese Tray offered by the Chamber of Commerce. 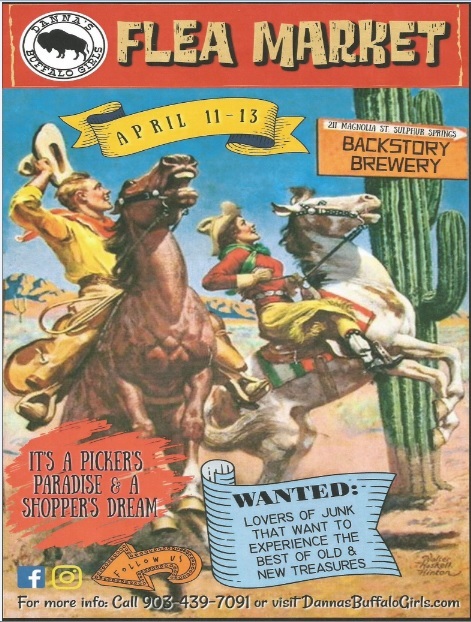 Festival sponsored by Cypress Bank. The Easter Bunny will be visiting downtown businesses from 10:00 a.m. until Noon on Saturday (Apr 20). Shop downtown Pittsburg and take your photo with “Pirate,” Pittsburg’s Easter Bunny. Pittsburg is scheduled to be declared as the Texas Hot Link Capital later this month. Join us on Saturday (Apr 27) to celebrate this esteemed declaration. 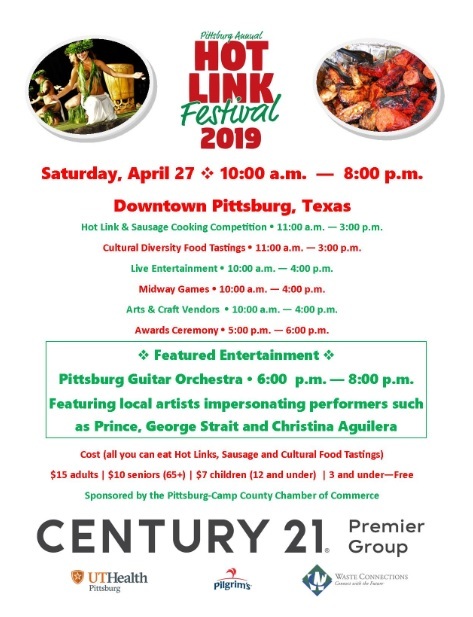 The Hot-Link Festival runs from 10:00 am until 8:00 pm and features a hot link/sausage cooking competition, cultural diversity food and entertainment, a midway of games for the kids, multiple vendors and entertainment featuring local artists from 6:00 – 8:00 pm. Century 21 Premier Group is the sponsor. 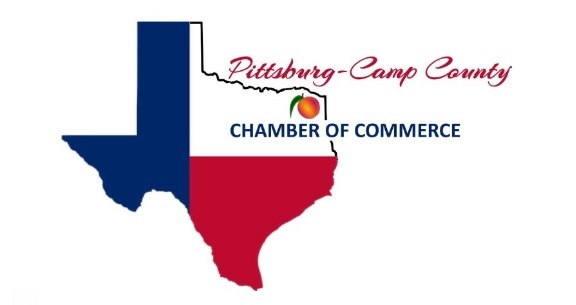 If you want your event included in our weekly email, send the information to info@pittsburgcampcountychamber.com. Instrumental Trio Performance, April 7, 2:30 p.m.
Northeast Texas Community College’s own Dr. Andrew Daniel will be joined by two members of his family for an instrumental trio performance on Sunday (Apr 7) at 2:00 pm at the Whatley Center for the Performing Arts. 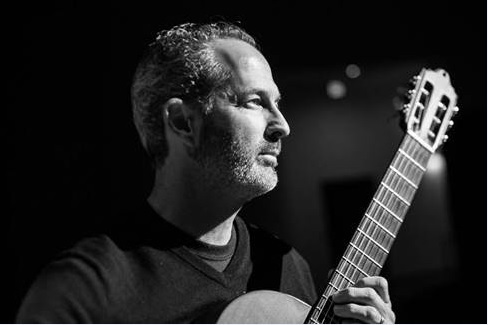 Daniel, NTCC Professor of Music, will play guitar while his 16-year old son, André Daniel, performs the violin, and his mother, Sherry Daniel, accompanies on piano. 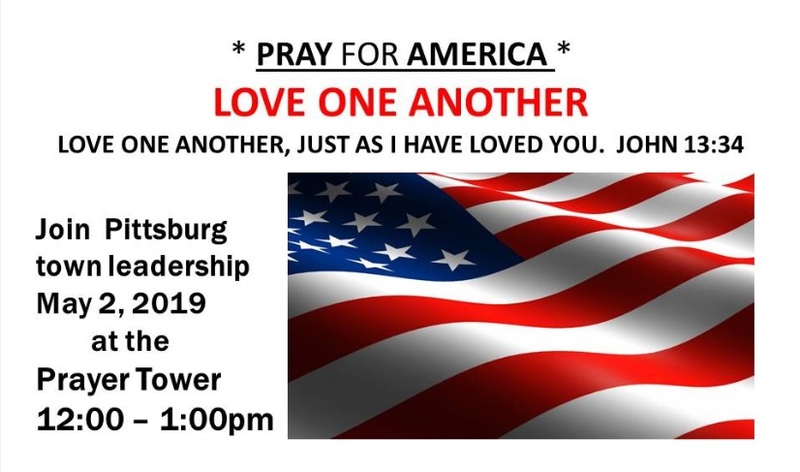 Tickets are $15 for adults and $5 for students and can be purchased online at www.whatleycenter.com or by calling the box office at 903-434-8181. 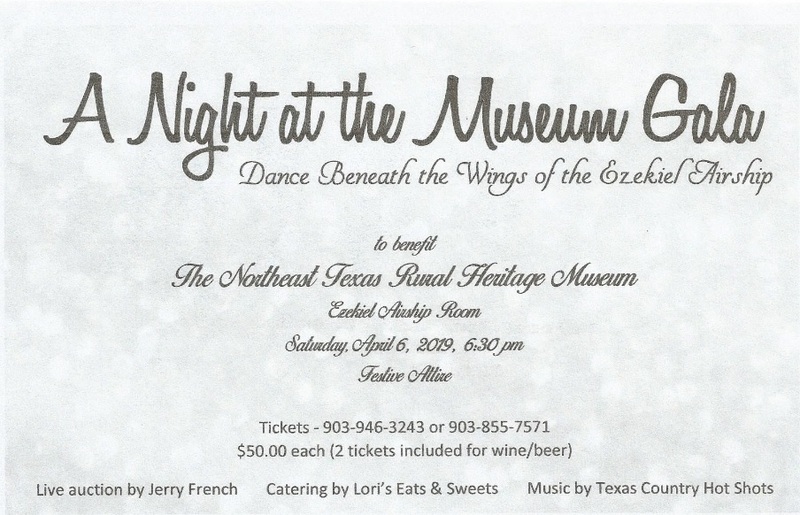 Proceeds from the concert will benefit NTCC music scholarships. If you have member news you would like included in our weekly email, please send the information to info@pittsburgcampcountychamber.com.